PORT OF VIRGINIA: It saw its second most productive month in history in July. New Cranes arrive at Norfolk International Terminals. The Port of Virginia saw an eight-percent increase in containers in July. The Port of Virginia processed a record-setting 252,679 twenty-foot equivalent units (TEUs) in July, an increase of nearly eight percent when compared with the same month last year, and the second most productive month in the port’s history. July’s growth was driven by nearly balanced trade: loaded exports and imports were up 9.4 percent and 10 percent, respectively. 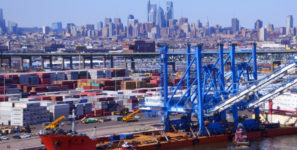 The port’s inland operations also grew, as volumes at Virginia Inland Port (VIP) and Richmond Marine Terminal (RMT) were up 24 percent and 83 percent, respectively. Truck volume was up five percent, barge traffic was up 27 percent and rail traffic grew by more than 8 percent.